Groundradar has just returned from an R&D project in Namibia, where UltraGPR was used to profile various dune forms as part of an on-going research project using radar to construct petroleum reservoir analogies. Dune 45, a star dune near Sussusvlei, is known as the “world’s most photographed dune” and has been a default wallpaper on Microsoft Windows (98, XP, Vista, 7). The radar profile shows the base of the dune to 70 m. The profile was acquired along a ridge of dune, resulting in unremarkable internal structures. 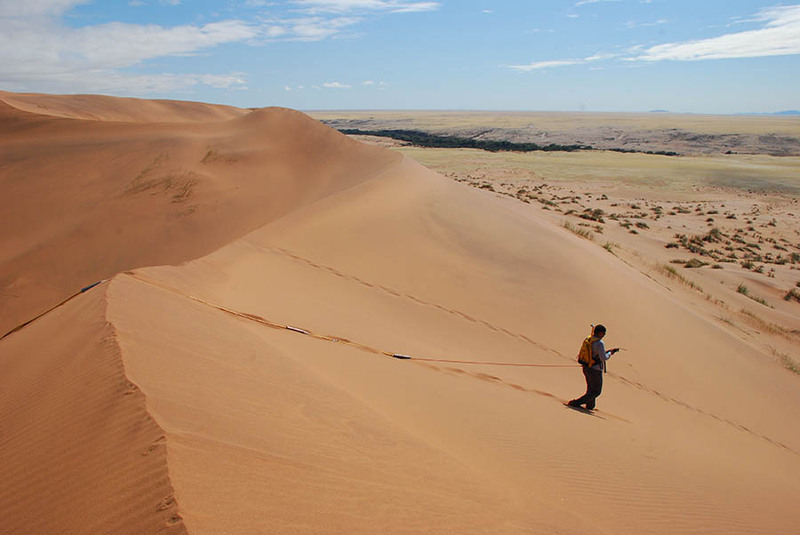 The Sussusvlei dunes are believed to be amongst the tallest in the world. A two-year development and testing project is drawing to a close with the imminent delivery of the first MineVue long-range radar system to the Government of India. MineVue is the longest-range shielded radar system commercially available. It is also the first low-frequency Intrinsically Safe (ATEX) radar system in the world, suitable for use in underground coal mines.